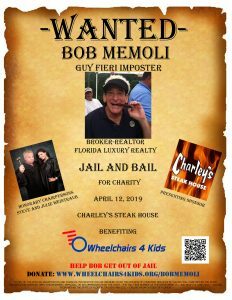 Bob Memoli aka “Guy Fieri” has been charged with being a Guy Fieri Imposter. Bob Memoli, a pillar of the community has a double life! A warrant for his arrest has been issued. Recently, he has been spotted at various Rotary outings and restaurants sporting a spikey, bleached blonde wig and enthusiastically talking about big bites and his favorite drive-ins and dives! He can be heard asking people if they want to go to Flavor Town! It is believed that he is using this ruse to try and get into the kitchens of restaurants and steal their culinary secrets. Perhaps he plans to open Bob’s Bodacious Biscuits? Bob Memoli is a hero in the community. He has been a supporter of countless charities and is active in The Rotary Club of Seven Springs. Bob is a broker realtor with Florida Luxury Realty. He has been selling real estate for over 25 years with sales in excess of $180 million dollars and over 1200 properties sold. Bob’s philosophy in selling homes is listening to his customer’s needs and letting them make the right choice. His motto is, “I will sell your home, period.” Whether you are buying or selling, you will be working with a true professional who cares about you and building a lifetime relationship.